In February 2016, Brendon McCullum stood on the outfield at Hagley Oval, gave a brilliant speech about his international career - and, just like that, was gone. A new life awaited him, as a freelance T20 player, his second act. While T20 was created a year after McCullum's international career had already begun it "was always more of a natural fit," he says, when we meet at the Ritz Carlton hotel just before an IPL training session with Royal Challengers Bangalore. 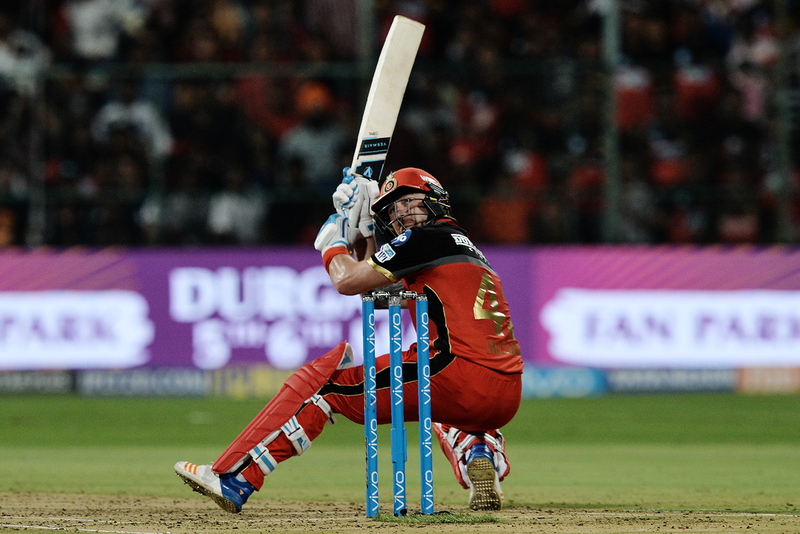 He is one of only two* overseas players - AB de Villiers is the other - to have played in all 11 IPL seasons. 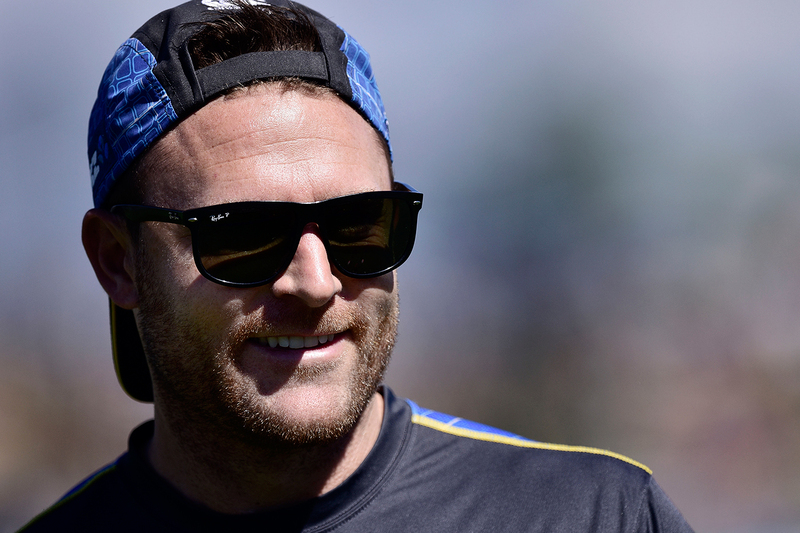 McCullum has witnessed the IPL become "much more professional," he says. Late-night parties have given way to protein shakes. T20 did not teach McCullum any new shots. But the format led him to hone the repertoire that he already had, imbuing him with the confidence to transport this expansive approach into ODIs and Tests. "I was always one of those guys who was chasing the special innings rather than necessarily trying to be a consistent cricketer," he reflects. "T20 asks you to travel at such a speed. You've got to push the envelope constantly, and then sometimes when you push the envelope, you realise there's certain shots which you incorporate in different games. "You've got to be trying to hit a six to hit a six, right? That mindset change - that you're chasing sixes - actually allows you to be able to do it." And so T20 life on the road was a natural postscript to McCullum's international career. "I love playing cricket, so for me it's easy. I mean the money's great, but that's not what it's all about - it allows you to have a great life, but you wouldn't be doing it if you weren't having fun." For all the high-octane games that McCullum still plays, his life is far more relaxed now than when he was captaining New Zealand. "It's pretty demanding, not just physically and mentally; on your life it can be pretty consuming too." Now he can "have a beer at night-time, and off tour do plenty of stuff with family and friends, and just live life". Between tournaments he doesn't do any cricket training in New Zealand at all, instead arriving for competitions early. McCullum can afford to do so because of how well he understands the intricacies of his own game. His overarching approach to T20 batting is: "I'll go at them early in the over, try and get them to back their length off, and then that brings in my six-hitting on point and also square of the wicket on the leg side." To him, successful T20 batting inverts cricketing logic that players should focus only on the ball, and not who is delivering it. "T20 taught me to play the man a little bit more," he explains. "You've got to pick up cues from the guys that you're playing against - how's his body language, what's the way he's walking back? If you've hit him for a boundary early can you see it in his eyes that he's lost a bit of confidence? And what's his go-to delivery when he's under the pump? Things like that. So you start to play the man a little bit more. "Especially later in my career, I started bringing that into one-day cricket, but also into Test cricket as well." In T20, everything is different. McCullum views quintessential "good cricket" logic as damaging in T20. If a batsman hits a boundary at the start of an over, and then takes an easy single from his next ball - long considered "smart batting" - it irks him. "Nothing shits me more than [a] boundary-one [sequence] - and everyone claps and it's the old-school thinking… But to me you've passed up your opportunity to be able to win the game that moment. "You have opportunities through a T20 game - and it might be in the fifth, sixth over - where your team's flying and you can put the opposition away. So you need to identify when that moment is, take the risk. If you get out doing it, then the other guys will then have another opportunity down the line, but you've got to try and take the opportunity when you can, and you do that through the information that you've garnered. "And for me - if I get a boundary early then I'm looking to try and press a huge over, and if you can pick up a 20- or 22-run over, not only have you potentially won the game, but you've got that guy under real pressure, maybe even taken him out of the attack. And then that forces the opposition to go a different way." A similar approach informs his captaincy. "I always felt that you walk off and you've at least thrown arrows at the board. And I try and implore others [to] just keep making decisions - even if they're the wrong decisions - just keep making them, because then you're actually in charge of the game, to a degree, and you can bring games out of the fire." Importing this approach from T20 to ODI cricket led to McCullum's conversation with Tim Southee and Trent Boult the night before they played England in the 2015 World Cup. "We said if we had them two down for no runs, what would our field be? And we said, we'd probably have three or four slips. And like, 'Why don't we start like that?'" England were bowled out for 123. As a T20 captain, McCullum sometimes tinkers with the field after virtually every ball: more low skulduggery than deeply thought tactics. "A lot of the time we'll bowl exactly the same ball, just try and do it with a different field, to try and take the pressure off guys. Sometimes it's so hard to be consistent with your execution in T20, against such quality players now, so you're going to play a little bit of cat and mouse, a bit of chess. "And it doesn't always work, and sometimes you look foolish doing it - but again, at least you're the one that's making the decisions, and they're having to react to you rather than you chasing your tail around." When captaining against a top-heavy batting side, "you throw everything at it - you might allow your plans to be a little bit longer - whereas if you know their strength is more in the middle, then you might have to sort of save your plans until a little bit later on." McCullum wants his sides to bat with the same fearless spirit that he exhibits. Yet this attacking philosophy brings risks. In the Pakistan Super League, Lahore Qalandars, the side McCullum captains, were bowled out for 59 in a game last season, and 100 in a match this year. "It's come off the road occasionally," he reflects. "I'm not sure my captaincy style necessarily suits every environment. "I probably need to learn a bit more about some of those environments before you take on jobs such as that, because they are very different [from each other]. And it's just understanding how you motivate guys, and how you get across very clear and precise messages for them so that they can still operate at their best as well. That's probably something that I missed along the road, especially in the PSL - just understanding how to get the best message out to them; maybe you need to tell people more so than ask or invite them on. I mean, that's just understanding the different cultures, and it's hard to do sometimes in a six-week tournament." From chasing down a ball while fielding to taking down a bowler, McCullum hurls all of himself into everything he does on a cricket field. Yet the caricature of McCullum - as playing ferociously on the field, and then enjoying a few beers with his team-mates and opponents - gives one to believe that he relies on instinct more than he actually does. Indeed, he believes that shrewd pre-game planning can empower players to be more instinctive. "Everyone prepares differently, right? Some guys might spend two hours watching footage. I don't necessarily need that. I need to know, a) what type of bowler they are, b) what their variations are, c) whether it's a match-up for me or whether it's not, and d) what they're like under pressure. "You should do your own work so you can walk out there confident and thorough in your own preparation. I won't sit down and pore over footage, or even pitch maps and things. But I might be in the shower, I might be sitting there having my morning coffee - something will be going on in my head, thinking about the line-up that I'll be playing against, thinking about the wicket that I've got information on previously, thinking about the boundary sizes, thinking about what the crowd's going to be like, thinking about who's good under pressure, who's going to bowl with this, where are my potential weaknesses against this bowling line-up, and starting to just formulate a bit of a plan. Obviously you've got to be fluid as well, when things change once you're out there. But you've got to have some sort of basis of preparation to go in, and then once you have that then you can be that instinctive player." McCullum believes that we're only scraping the surface of data in cricket. He envisages in-game coaching growing too. "But the human element of identifying when you can press against the opposition to potentially win the game, that comes down to people's innate skill." The most effective batting, he believes, combines planning with instinct. "You need to understand your vulnerabilities as a batter as well as your strengths, and that's where match-ups are so important. If you are batting with, say, a left-hander, and they bring on a left-arm spinner - I know I'm not as strong against left-arm spin, as what I am against, say, seam bowling or right-arm spin, or even legspin, so therefore that's my vulnerability. So I need to be brave enough to say to my partner, 'Can you take the risk against this guy, put him under pressure, and I'll take on a different option in time', and just bounce off one another. "You play those match-ups throughout an order, and that makes you a dangerous proposition against a batting group - not just as an individual… I'm happy to get out to a right-arm seamer trying to hit him for 20 off the over - 'cause that's my match-up, that's my opportunity where I can try and take him down." Yet in franchise cricket there can be conflicts between a player doing what is best for themselves and the team. For instance, if a player excels against legspin but is unsure of their place in the side, they may be inclined to wait longer than normal before attacking - especially if, like in the IPL, an overseas player's salary is linked to how many games they play. "That's where everyone can only answer that question for themselves, but I know which way I would go," McCullum says. "I think we need to never lose sight of the human element and that 'play the man' scenario. I think match-ups are important, providing you have a selfless environment, and a consistent selection policy as well, which can be hard in different environments. Because if you know that your role is to take on a certain bowler and you get out doing it and then you find yourself on the pine, then that can also affect guys. "There's many times I've gambled and got it completely wrong, but I think I've worked a method out for myself which allows you to operate at a level where on some days you're going to be ultra-special, on other days it's going to be crash and burn, but overall you're going to win matches for your team. "Stephen Fleming said to me [that] over a 14-game season if you're winning two games, then you're doing your job. And there's different players who'll be more consistent over a 14-game streak, and they allow the match-winners - the guys who do travel at high tempos - to be as effective as possible." Would a team of six McCullums would be an ideal T20 batting line-up? He laughs. "No chance. I think you need a nice mix." The evolution of T20 will, McCullum believes, ultimately account for Test matches. "I firmly believe that Test cricket won't be around in time, because there's only so many teams that can afford to play it. And whilst we all adore Test cricket, and for me it is the purest form of the game - I'm loyal to it - I'm also a realist that people are turning up and watching T20." The endgame, he predicts, will be T20 franchises owning players. "And I don't see them releasing those players to play for their nation in a Test match." If this shift does happen, "T20 cricket could even go to [more] ridiculous levels," McCullum believes. "And I don't buy that you need residual skills to be able to then transfer into T20. To me, they're played with the same instruments but they're completely separate games. I think once we do separate it even more, the skill level of T20 cricket will go to a whole new level altogether." He intends to remain at the heart of this journey. Since breaking his arm last year, he has tinkered with his grip - which has, he says, given him more power hitting straight or through the off side. "I'm invigorated by it, to be honest, the way I'm hitting the ball." He envisages playing for a couple more years. Then he hopes to become a T20 coach, using the same enterprising spirit that has characterised his captaincy. "The IP of three hundred and something games is quite valuable, and I like the idea that I can help people. And I think if you're running an environment, then you have the ability to be able to free guys up." McCullum the coach will bring the belief that being successful in T20 is rather like being successful at poker. "The bigger the stakes, the more you're prepared to make decisions, and the more you're prepared to trust - gamble's the wrong word because there's preparation which goes into it. There's times when you've got to go left or right, and whichever one you decide can have a consequence on the games. Sometimes when there's even more on the line, we stop making decisions." That has never been McCullum's way.